Mid-October we took the boys on their first ever flight, a short trip for a few days down to Sydney. 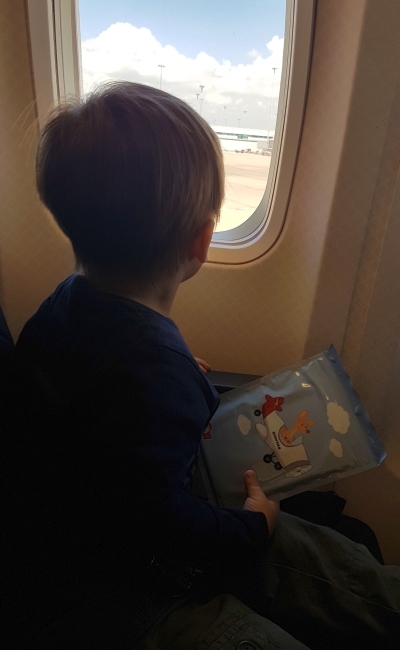 When I was planning our trip I was curious about how I'd keep the boys entertained on the flights and what our first flight experience would be like. I've had a few questions about that too so I thought I'd share more about what the flights were like as well as what I was wearing. Feel free to skip the flight-related stuff if you're not interested and just focus on the outfits, it's a bit of a long post otherwise. Toddler T is 3, and Baby Boy is 19 months. Both are good walkers. We took a travel stroller but checked it at the gate along with a suitcase and I had my Ergobaby carrier (which couldn't be used during takeoff and landing or to go through airport security, but can be used at all other times). Baby Boy was on an infant ticket and had to sit in my lap, Toddler T had his own seat. For luggage, we had my Louis Vuitton speedy bandouliere, the baby bag, hubby's backpack and a carry on 'pull along' suitcase as hand luggage. We flew Qantas both ways. Both flights were mid-morning flights, when the boys are most relaxed. Toddler T was enthusiastically greeted and given a small activity pack gift on boarding and the flight attendants were polite, friendly, and reminded us we could ask them for anything if we needed help. Simple comfortable outfit for our first flight. While it was a warm day in Brisbane, I suspected I might need the light duster on the plane and in cooler Sydney. This duster washes well, dries quickly and the print disguises any creases so it's perfect for travel. While I had multiple outfit choices for the boys, I limited what I brought along to just one pair of shoes (my trusty Converse) and these jeans and a maxi skirt. I usually wear jeans when flying, they are comfortable and it also means that the the heaviest item of clothing is outside your bag in case you're getting near the baggage weight limit! Last worn: stripe duster, khaki embroidered tank, grey skinny jeans, Converse, Louis Vuitton Speedy Bandouliere. Other ways to wear: stripe duster and chambray dress, khaki embroidered tank and denim shorts, grey skinny jeans and colourful cardis, Converse and a shift dress, Louis Vuitton Speedy Bandouliere and maxi dress. Perfect for pregnancy: stripe duster and maternity shorts, Converse for second trimester travel, wrap dresses and speedy bandouliere in second trimester. The flight from Brisbane to Sydney is only around an hour and a half, so we didn't have to keep the boys amused for too long. We also luckily didn't have to attempt using the airplane bathroom with either of them. 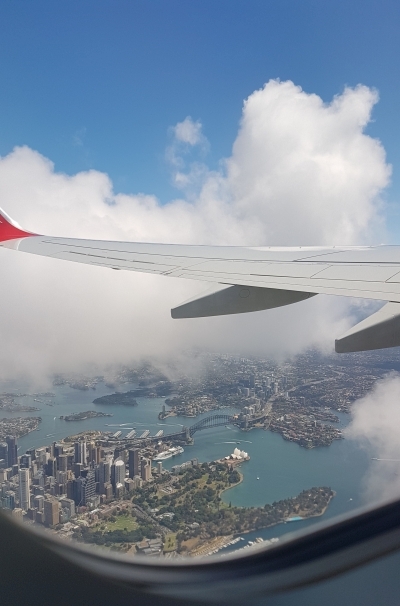 Not always possible, but definitely helpful for us to have a small flight as our first one, and it's one of the reasons we picked Sydney to travel to. We didn't board right away, and waited until the line was shorter so they weren't standing in one spot too long. Toddler T had his boarding pass so he was responsible for getting it scanned and showing it to the flight attendants as we boarded which got him involved. We found it best to have Baby Boy and I on the window seat with Toddler T in the middle of hubby and I so there were two sets of hands if either boy needed anything. Boarding time is a good time to wipe down the tray tables and other surfaces with a disinfectant wipe too. If you're breastfeeding remember that baby has to stay seated in your lap and sitting upright for takeoff and landing, so you'll need to wear something you can easily pull down or unbutton to breastfeed as your toddler sits up. Breastfeeding during takeoff and landing is a good way to help with the pressure on little ears. The flights were around regular morning tea time for the boys so that they would be looking for something to eat. As they are so small, eating and drinking during takeoff and landing is the best way to relieve the pressure in their ears. In keeping with my usual over-packing style, I had a Bento lunchbox with two 'levels' of snacks, as well as two identical smaller snack-boxes. This worked out well for our first flight, when baby Boy enthusiastically grabbed one of the smaller boxes and managed to open it and shower the gate area with food. I was relieved to still have the second backup box. We opened out the second 'level' of the lunchbox for snacks for the descent. While they weren't as hungry at the end of the flight, having favourite foods and treats available like biscuits meant they were still happy to eat and help their ears on the descent. One important point to note is that you have to check the customs requirements for food. There are interstate laws about taking fruit across state lines in Australia. This meant we picked strawberries, raisins and apple which could be freshly prepared, cut and washed the morning of the flight and completely consumed before landing. We left out bananas and mandarins as we didn't want to get in trouble for still having the peel, and just bought more fruit when we arrived in Sydney. As well as the activity pack Qantas provided, I brought a few books along, some colouring books and activity packs with stickers and pencils. 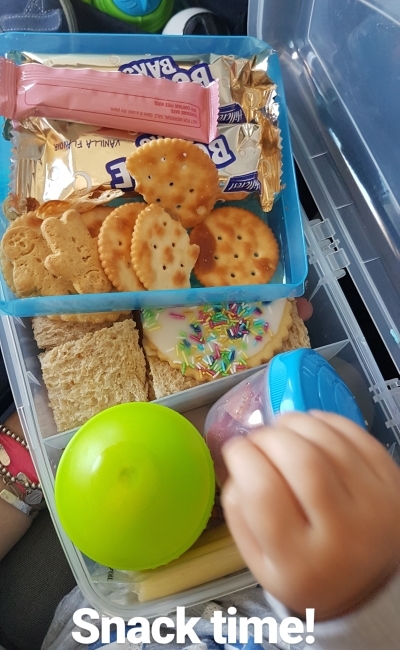 We put the bento lunchbox in the seat pocket, along with their drinks and a book and kept the activity packs in the baby bag under the seat in front. With backups in the carry on case we put in the overhead compartment, but never needed to use. We didn't bring toys as everything you bring will end up on the floor at least once. My teething necklace was the only 'toy' as it stayed around my neck, and Baby Boy gnawed on it a little when he got grizzly during the descent into Sydney. On takeoff we sat the lunchbox in Toddler T's lap so both boys could easily reach it and pick what they wanted to eat. Once the plane was level, we packed it away and did some of the activity books together until the refreshments were served (we asked for a bottle of water at this point to refill the boys drinks). Once they got tired of picking at the bun provided for morning tea, as neither of them seemed to like it, we got out the books to read and did some more activity packs. 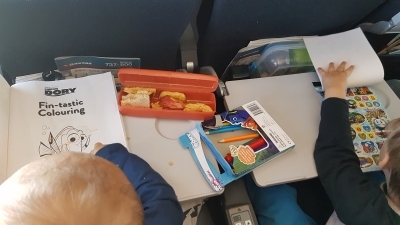 We followed what the boys wanted to do and changed activities as they wanted until it was time to descend and pack up the tray tables and bring the snacks out again. For weeks leading up to the flight we were reading all the plane related books we had, explaining the check in process, take off and landing. Knowing that the plane would go fast, that the plane would be noisy and that eating and drinking will stop your ears feeling funny helped. Instead of trying to detail everything in the moment, we could quickly refer back to earlier conversations. With a toddler who doesn't like loud noises, explaining each and every noise and movement of the plane helped calm any fears. A tip I picked up from my Dad, who would always tell us what noises to look out for next on our flights as kids. It's a habit now! This is what I wore for our flight home from Sydney to Brisbane. The same duster, jeans and shoes, just a different tank. I wore my Converse every day, there was no room to pack two pairs of shoes with all the extra clothes I had for the boys. I did manage to pack an extra handbag though, ha! I used my Speedy Bandouliere most days. It's so helpful having a cross body bag when you're navigating airports with toddlers in tow. My jeans were covered with food crumbs after the first flight, but nothing that a baby wipe couldn't fix to make them presentable enough to travel home in a few days later. The ultimate mum essential: baby wipes clean everything! Last worn: stripe duster (above), navy breastfeeding tank, grey skinny jeans (above), Converse (above), Louis Vuitton Speedy Bandouliere (above). Other ways to wear: stripe duster and flares, navy breastfeeding tank and maxi skirt, grey skinny jeans and purple cardi, Converse and colourful jeans, Louis Vuitton Speedy Bandouliere and a dress. Perfect for pregnancy: stripe duster and skater dress, bubble tank in second trimester, Converse in Third Trimester, speedy bandouliere and maternity pencil skirts. 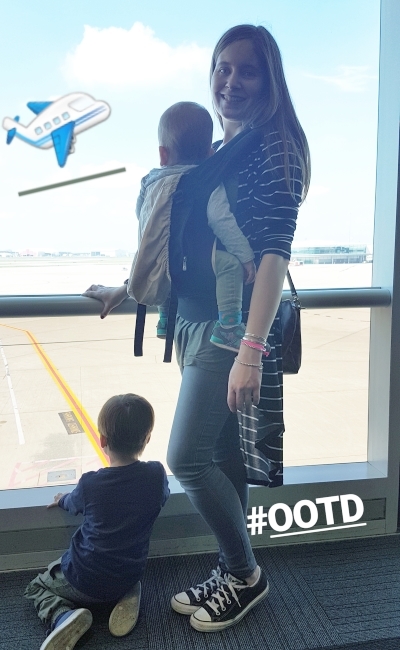 Comfort is key when flying with toddlers - you don't want to be fussing over your outfit. Make everything machine washable as it will get dirty! A cover-up like a cardigan or duster hides spills and stains and keeps you warm on a cold plane. Converse are comfortable and practical for running around in airports. Jeans are a good choice too as you can easily wipe food crumbs off with a baby wipe. Linking up with Fab Favourites, Mummy Monday, Style Nudge, Hello Monday. Yes, snacks are always a good idea, haha! Your outfit is perfect for travelling, I always bring a cardigan with me even in summer since the airconditioning in the airports is always low and I am always cold!!! Happy Friday Mica and I hope you have a lovely weekend!! Yes, even if Sydney had been warmer I still would have brought a cardigan for the plane! How I love reading this, I remember myself putting food in little containers for my toddler on our recent US trip. 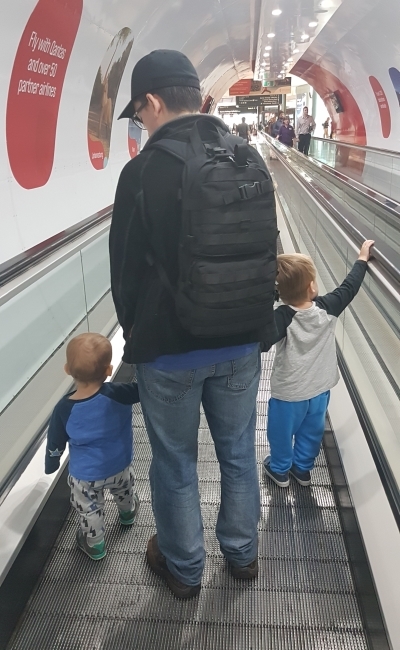 You're very organised, I think your boys enjoyed their first flight. Very comfy outfit you wore too, so good to plan ahead. Food is the best thing to keep toddlers amused, haha! Toddler travels so fun, I took my oldest on a long train trip.., I fell asleep from exhaustion, she crawled around while other passengers watched her... suffice to say we flew home, it was a quick 2 hour trip ... no more train trips for toddlers. With my youngest I had to fly to the US... she was a runner, I had to have US attached by wristbands with a coil... that saved me multiple times. Oh how lucky the other passengers could help. Planes are certainly faster but you have the pressure changes to deal with! Hi! Great post on traveling with children. Your outfit look comfy and super cute! I pray you and your family have a blessed weekend! Such great travel style and great tips for flying with little ones. Have a lovely weekend. Perfect and sensible travel look! Great tips for traveling with toddlers! What a good prepared Mum you are! I'm always boggled by families who haven't brought any of the distractions for the kids on the flights. I feel bad for the kids! (not to mention the other passengers!). When I was a kid, we went to Disneyland and Hawaii several times - my Mom was so good about making sure we had LOTS of stuff to do at all times. For me, that was always books! Woohoo! Sounds like a pretty successful first plane trip! Definitely smart to start with a shorter flight too, haha. Now you can just keep building up! Yes, that's the theory, hehe! Not sure where we will go next, maybe a longer flight next year. I love that long sweater, it looks like such a cozy, chic piece that's perfect for traveling. Glad to hear the flight went well with the kids! Comfort is definitely key when traveling, and I love that you still look so chic! I don't have any toddlers yet but these tips will be very handy for when that day comes! Have a great weekend! I do too! I think even when the boys are grown I'll still be carryign babay wips around, haha! Sounds like this went so well and you all did a great job preparing for the flight. Il ove the snacks and activities. So smart to do a short flight the first time. Cute post! Love your outfits. I don't remember how old I was for my first plane flight! I DO remember becoming horribly sick on it though, and that unfortunately has stuck with me, eek! Was so busy this time with the boys I didn't even notice it! Exciting! I a glad the trip was a success for all of you. Amazing effort to still look so put together and relaxed when you were travelling with two little ones. It's great that you seemed to have a good time traveling with toddlers! I remember when my mom was traveling with my baby brother, and I honestly wonder how she got through those considering how hyperactive he was! Lovely! You own it! Have a good day! Love your outfit! I love the duster! Awww the snack boxes you put together for your little ones are adorable! 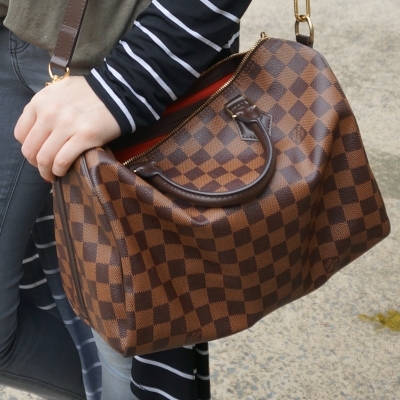 You look really lovely for traveling; a great casual look, complete with gorgeous bag. What a fun and nostalgic post on how to travel with the little ones. It does seem that snacks, and more snacks, are the main thing. And yes having them walk around as much as possible is very helpful. It was almost 3 decades ago when I had this problem but I remember it like yesterday. I must say that flying back then was much easier than it is now ! True! Snacks are good at any age! Lol covered in crumbs, the hazards of travel and parenting. I love the grey jeans though and obviously your LV bag! Bringing snacks and things to do is a great idea! These are great tips! We had most of these items when we traveled with our daughter overseas this summer. Sticker books were wonderful because we didn't need to bring crayons. Lots of snacks are super important too!! You can never have too many! Very true - if there is too much left over it gives you something to snack on too...ha! Mum life! Mica, you are an exemplary mother! This is so awesome! I will have to share with other mommy bloggers. Awesome post! It is such a good trick, especially for an over-packer like me haha! Yes it's good to avoid sitting for too long! Love that shot over Sydney! My friend took a similar one yesterday and posted in on FB and I just love it. Sounds like the kids were pretty perfect on the flight! And that you did some sensible things to make sure they were entertained! 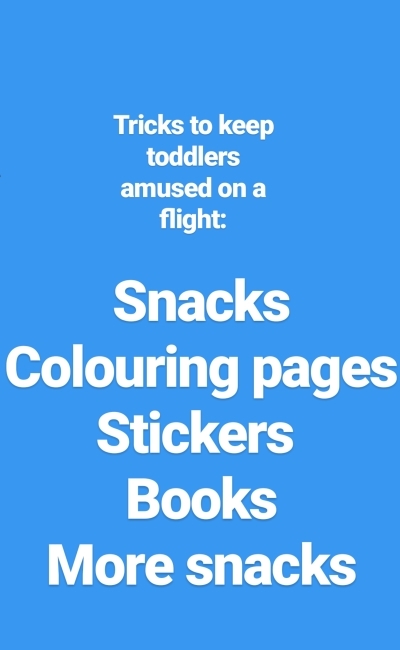 I can imagine it would be super stressful to fly with two small children but you've made it sound completely do-able! I think preparing is key, and getting lucky and having both kids in a good mood, haha! Snacks are the cure for all toddler problems I think, ha! Wow you thought about so much with flying with your boys. I think I'd just wing it and help for the best! hehe I've always been someone who over prepares and over packs and just worries before big events, ha! awwww... lil guys looks manageable and cute! Glad the boys had a good first plane ride! I was 10 when I took my first flight! I love your travel look, very similar to what I'd wear, but definitely no lace up shoes, since they have be taken off to get through security. Oh i didn't even think of that! We have different rules for domestic flights here though, I luckily never had to take my shoes off. Was annoying taking the baby carrier off to get through security though. You were so well prepared! We have only taken our oldest on a flight before we had either of the others, but I think a flight with all of us is in the near future! Thanks all for your lovely comments - glad you found this post interesting and useful, a little different from my usual!